Check out more photos in our photo gallery of PV and this beautiful paradise we're living in! Anyway, as Kirk stood up to bolt down the companionway stairs, his legs almost buckled underneath him (Clue #1), and he sort of crawled/fell down the stairs to the bottom. He made it to the settee and lay down, then said he was going to be sick, so Heidi grabbed a bowl for him to throw up in. He NEVER gets sick, this was about the third time in his life he'd ever threw up (Clue #2.) He felt awful, very flu-like, and just wanted to sleep and be left alone. And since we knew other cruisers who'd suddenly gotten sick recently, we weren't immediately concerned. Sadly Heidi actually asked him if he were drunk when he stumbled down the stairs and threw up! She didn't really think he had had too much to drink, but his actions were exactly like that of a drunken sailor. Now we know, if you're ever with someone who suddenly exhibits signs of being a drunken sailor when you're pretty sure they are NOT, get them to the ER right away. It may be a Cerebellar Infarction Stroke. About midnight Kirk got up to pee and his legs really wouldn't work. Heidi had to help him to the bathroom (Clue #3), and when Heidi made him drink some water cuz she thought he might just be really dehydrated (after all, clumsiness is often a first symptom of dehydration), he couldn't get the glass to his mouth, instead it smashed into his face and spilled all over (Clue #4 that something was VERY wrong.) Heidi suspected it might be a stroke, and asked him to raise his arms above his head, smile, and answer questions (all the things you've read about strokes in those emails or on Facebook! ), but he did everything just fine with no slurred speech...so we weren't really sure what was up. Ginny & Stephen had asked us to keep them posted on how Kirk was doing that night, so Heidi called them after she called Pam Thompson. 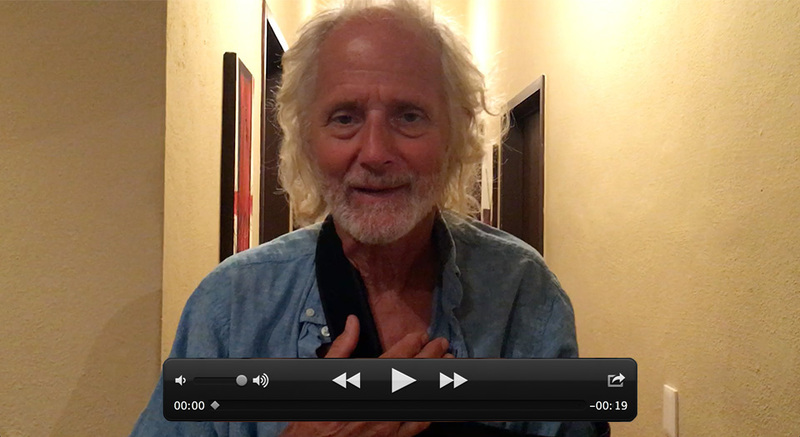 Ginny came right over and even rode in the ambulance with us to San Javier, Nuevo Vallarta, a good 45-minutes away. It had also taken the ambulance crew 45+ minutes to get to the La Cruz Marina and check Kirk out... he was able to sort of crawl up the companionway stairs, then the EMTs got him onto the gurney. The EMTs were FANTASTIC, and even spoke a bit of Inglés so we were in great hands. This was our first time ever in an ambulance, a very "Twilight-zone" experience. By the time we were at the ER, it was 1:30am, and the stroke had occurred around 7pm, so far too late to get the TPA drug. EMT Christian made our first ambulance ride ever, far less stressful that it could have been. 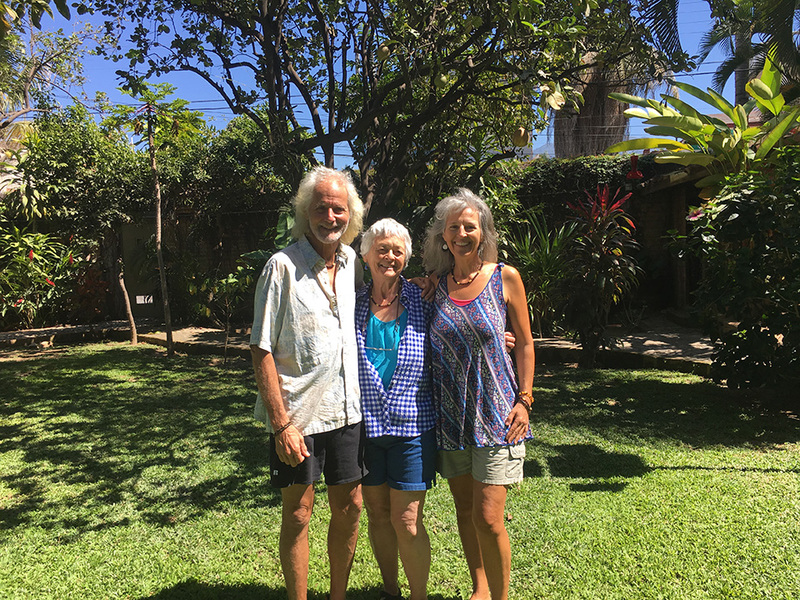 Throughout this whole ordeal, we've had several amazing instances of synchronicity, the first one occurred on Valentines morning: 0730 as Heidi was running late to catch a cab back to the hospital she thankfully ran into cruising friends Judy & Fred on their morning walk. They had a car and Judy drove Heidi to the hospital. The second instance of synchronicity: as Judy dropped Heidi off at the hospital, Heidi noticed there was an ambulance parked in front of the hospital, and suddenly noticed they were wheeling Kirk on gurney into it!? Heidi asked Kirk what was going on, where was he going? And with a look of panic on his face, he said "I don't know!?!" Heidi quickly determined they were transporting him to the downtown San Javier Marina Hospital for the MRI, and hopped into the ambulance before they even got Kirk in--she was not going to be left behind to wait and wonder! Our second ambulance ride of our lives. 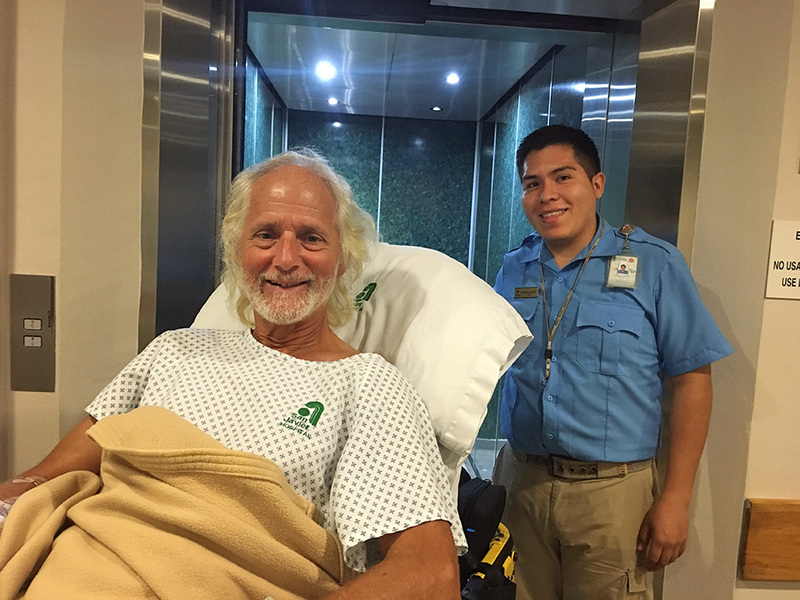 Although they said they'd bring Kirk back to Nuevo Vallarta after the MRI, they in fact kept him at San Javier Marina Hospital and admitted him to ICU there, so Heidi was particularly glad she'd hooked up with Kirk and the ambulance that morning, and not spent the day waiting at the wrong hospital! Meanwhile Kirk's backpack, cell phone, and wallet were still back in his room at the Nuevo Vallarta Hospital. It's the little things like that that make you panic! 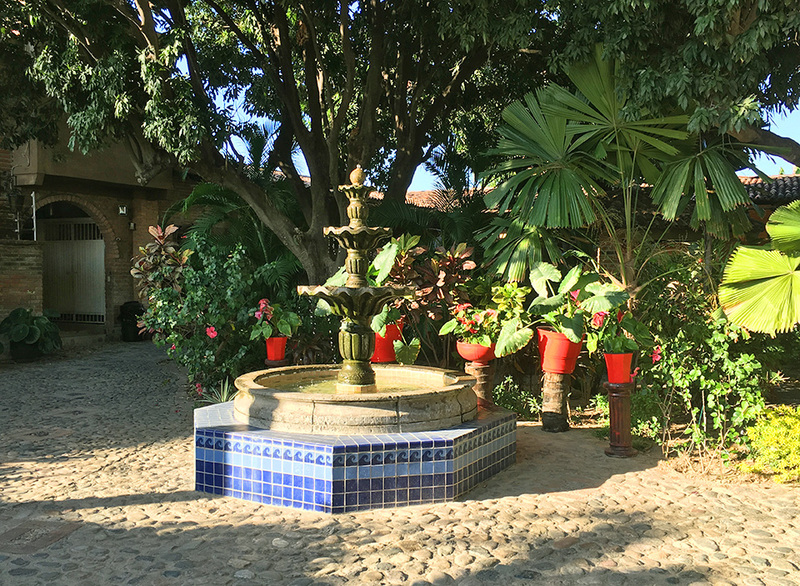 Amazingly the hospital provided a courtesy car and driver who drove Heidi back to San Javier Nuevo Vallarta to pick everything up, and then drove her back to San Javier Marina Hospital again, an hour+ round trip ride. The MRI showed that Kirk's stroke was a Cerebellar Infarction Stroke (a blood clot in the cerebellum area at the back of the head near the brain stem.) If you know Captain Kirk, you know he's one-in-a-million guy! So it's only natural that his particular type of stroke is very rare one too, occurring in only 2-3% of all stroke patients. A Cerebellar Infarction Stroke also has totally different warning signs and symptoms than most people are familiar with as "a stroke", so hence the reason we didn't recognize it correctly as a stroke for almost 5 hours. The symptoms of this type of stroke mimic the flu: dizziness, vertigo, vomiting, and lack of coordination, because of these symptoms it's often miss-diagnosed and has a higher mortality rate than other types of strokes. He was VERY lucky. As it would turn out, this stroke was a symptom of a much worse heart condition that could have killed Kirk in his sleep. Kirk was also VERY lucky the stroke did NOT effect his speech, memory, or facial characteristics, nor cause any paralysis. It did effect muscle coordination in his right side, large motor movements like walking and using his right arm (hence smashing the glass into his face...he could use his right hand/arm, but couldn't tell it when to STOP moving), as well as issues with balance, dizziness, and vertigo. With daily PT exercises, he's now walking well and practicing writing again. He needs to build up strength and coordination in the right side of his body, and we're still working on resolving his dizziness and vertigo which we're hopeful will diminish very soon. We're especially grateful for the counsel of our old dock neighbor and friend Jill, an ER Stroke nurse in Seattle who had so much great stroke info to share, questions for us to ask the doctors, and information to help us understand this type of stroke. So back in the ICU, they kept Kirk for 36 hours, not because he really needed ICU, but because that is where they had the cardiac equipment to monitor him, including a Holter monitor he wore for 24+ hours. As we learned, an EKG takes a "snapshot" of your heart, and if everything is working fine at that moment in time, your heart looks great. In fact, Kirk had just had an EKG prior to his hernia surgery one month before, and his heart "looked great"! The Holter monitor takes a continuous 24hr. EKG showing any variances in "normal" during that time. So it was able to detect that on occasion when Kirk sleeps his heart rate drops as low as 25bpm! (Normal is 60 beats per minute.) It also showed that he has short bouts of Atrial fibrillation (A-Fib) where the heart beats too fast, and Flutter (where the heart beats irregularly.) It's most likely that the A-Fib caused a clot to form in the heart that then migrated into the brain, causing the stroke. Kirk's brother also has A-Fib, and their dad likely did as well. It's unknown how long he's had these underlying heart issues, but his swollen leg started about 8 months ago, so it's been a while. He could have died in his sleep from his slow heartbeat... SO MANY THINGS to be THANKFUL for!! Visiting hours in ICU were very short (11am-1pm and 5pm-7pm). Since it took Heidi an hour each way to go back and forth between the boat and the hospital, she would come in for the morning, stay 2 hours and go back to the boat and the kitties for the rest of the day, trying to get some sleep and food in-between and catch up. There was no food anywhere near the hospital, but thankfully cruising friends made her meals and took her out for dinner one night. On Wednesday noon they finally discharged Kirk from ICU to a very nice private room, and then let us know he'd likely be discharged from the hospital on Thursday afternoon, pending visits from the neurologist and cardiologist. They also let us know the was not allowed to go back to the boat until his dizziness/vertigo and balance issues had resolved, and we would need to find lodging in town. Not an easy feat as this is peak high-tourism season, with the highest number of tourists seen since 2008!?! Where would we go? And could we find a place that would let us bring the gatos del mar? The would be instrumental in helping Kirk recover! We wanted our whole family together. The third instance of synchronicity: Heidi put out an ask on Facebook for anyone with connections to lodging in the downtown Puerto Vallarta area to please contact her. Our Elliott Bay Marina friend Mike in Seattle put us in touch with his friend Emily who lived in PV, and she in turn put us in touch with her friends Leslie & Dean... who had a private guest house at their beautiful 60-year-old Mexican Hacienda which we could rent...just 3-blocks from Kirk's doctors!! Within 2 hours of Heidi putting out the ask, we had secured a place for Kirk to recuperate in PARADISE! 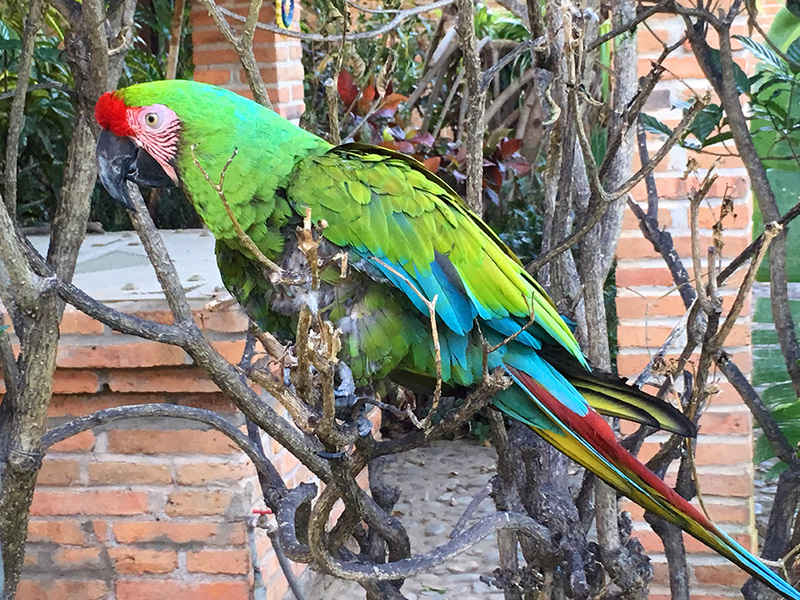 Complete with swimming pool, lush tropical gardens--a botanical gem, two macaws, AND we could bring the gatos with us! We are forever grateful to Mike, Emily, and Leslie & Dean for helping us out in this time of need. Thursday morning Heidi took the hour long bus ride from La Cruz back to the hospital, and brought Kirk some clothes in anticipation of his being released. Dr. Aguilar, the neurologist, came in to give Kirk the all OK. He had him standing up, eyes closed, arms extended, and trying to push him over. Wahoo! Kirk held strong and couldn't be pushed! Now we just had to wait for the cardiologist, Dr. Valadez to give Kirk the OK to be released. We waited, and waited, and waited....and finally he arrived around 4pm with big news: Kirk needed to have a pacemaker installed to keep his heart rate from dropping below 60bpm! And they wanted to do surgery that night...WTF?!? Here we were all ready to check out and start Kirk's stroke rehab, and suddenly he has to have more surgery?! A pacemaker?! Really?! What does this all mean?! Our heads were swimming!! But Heidi's step-dad Pete has one and said it's one of the best things that happened to him. We called our good friends Pat & Karyn (who sailed with us to Hawaii 20 years ago! ), who are doctors in the cardio thoracic field. Heidi took photos of all of Kirk's charts and texted them to Pat who help us understand Kirk's heart condition and make some major, time sensitive decisions. Another sailing friend Suzie, a long-time pacemaker wearer herself, gave us lots of info on what to expect post-pacemaker, and quickly we learned of 5-6 other friends who had pacemakers that we never knew about, and it was "no big deal", "just do it!" And so fours hours later we found ourselves on our third ambulance ride of the week, back to Nuevo Vallarta, because the cardiac operatory downtown had a piece of equipment that was awaiting a part. Christian was again our EMT, and it was like "old-home-week", joking around in the ambulance on our way to another surgery. We were also happy to see Dr. Franco when we arrived back at Nuevo Vallarta, with his big sonrisa :-), we thanked him so much for coming to see us and for all his initial care and diagnosing Kirk's stroke. If you are ever in Nuevo Vallarta / Paradise Village area and end up in ER, you'd better hope Dr. Franco is your ER doctor, he's FANTASTIC!! Kirk's surgery was due for 2100 hours (9pm), but it was delayed by several hours due to some emergencies ahead of him. Heidi, running on empty, not wanting to be up all night again, took a cab back to the marina and gatos, and to bed by 11pm. She got a surprise text from Kirk at 1:03am Friday morning, "ALL OK back at San Javier Marina downtown, arm in sling, love you, you still up?" Nope...she was staring at the backs of her eyelids. Leave it to Kirk to make friends with his anesthesiologist! He woke up at the end as they were still stitching him up. They were playing some Mexican music, and Kirk jokingly asked "You got any Beatles or Led Zeppelin?!" Sure enough! The anesthesiologist pulled out his cell phone and started playing: Beatles Come Together; Buffalo Springfield For What It's Worth; and Bob Dylan Like a Rolling Stone; a Canned Heat song started up as they wheeled Kirk out and he didn't get to hear it. After all, it was 12:30am and they wanted to go home to bed too! Pacemaker surgery is usually out-patient, and we finally got the OK from the cardiologist for Kirk to be discharged on Friday morning. He was ecstatic, yet a bit dismayed about all of the medicine he now had to take: pain killers for the surgery; blood thinners (a new-generation anticoagulant) to prevent clots; another drug to prevent A-Fib; and a fourth drug to help with post-stroke brain inflammation. This has been a pretty trying experience for Kirk who's always been very healthy and active, vegetarian, practicer of yoga & meditation, and alternative medicine...to suddenly have another surgery, and now take daily medication (actually 4x a day!) But Kirk has embraced it as something that just has to be done in order to recover fully, and he's well on the mend. Friends Paul & Judy picked Kirk up at the hospital and drove him to the guest house. And back at Marina La Cruz, friends Fred & Judy drove Heidi and the gatos along with food and clothing to meet up with Kirk. 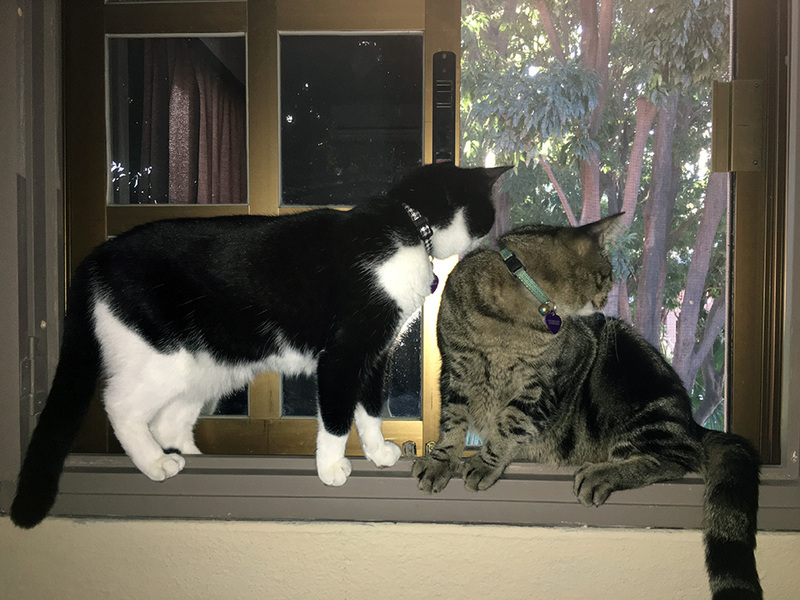 Tikka & Tosh looking out the window at the screeching macaws below...they don't quite know WHAT to make of the ruckus! We're now well settled into our guest house with Tikka & Tosh (they're not sure what to make of the Macaws and so much room!) Kirk's stitches are out, his wound is healing well, and his wonderful Physical Therapist Paul comes to US! We've had many local sailing friends stop by to visit, and our old Seattle racing buddy John and his wife Sara, who were vacationing near-by, also stopped by for a fun visit. We don't know yet how long we'll be here, or when we'll be back on the boat. We're taking things one-day-at-a-time, it could be weeks, or months before Kirk has his balance back and gets rid of his vertigo. We're certainly hoping it's a shorter time frame, but the reality is, we just don't know. We're in a wait and see mode while actively exercising and doing everything we can do to make Kirk whole again. In all of this, there is SO MUCH to be thankful for! Puerto Vallarta has excellent medical facilities with many bilingual doctors and staff, which helped supplement our mediocre Spanish. We are indebted to the cruising/sailing community in Banderas Bay who rallied around, helping to take care of our boat, our cats, make us food and provide us rides while everything was so topsy-turvy that first week. We're also grateful for all the synchronicity through friends-of-friends that enabled us to find the perfect living space near doctors and hospital. And we extend a BIG THANKS to ALL OF YOU for all the love and healing energy you have been sending our way, it's truly helping! The Captain is recovering more and more each day thanks to each and every one of you! Heidi's mom Jean came to visit us from Tucson and help out with Kirk's recovery. While Kirk was taking long afternoon naps, Jean and Heidi got to explore some sights of Puerto Vallarta, as she'd never been here before. THANKS so much for everything Mom! Many THANKS go to our family members coming to visit and help us out as well. Heidi's mom Jean was here all week, just headed home today, THANKS for everything MOM!! Kirk's brother Galen and his wife Ann will come help later this week, and more of Heidi's family, Teresa, Annika, and Noelle all arrive in the next couple of weeks. We are GRATEFUL!! Thanks in advance for any donation you care to make. We truly appreciate all the love and support everyone has shined on us!! 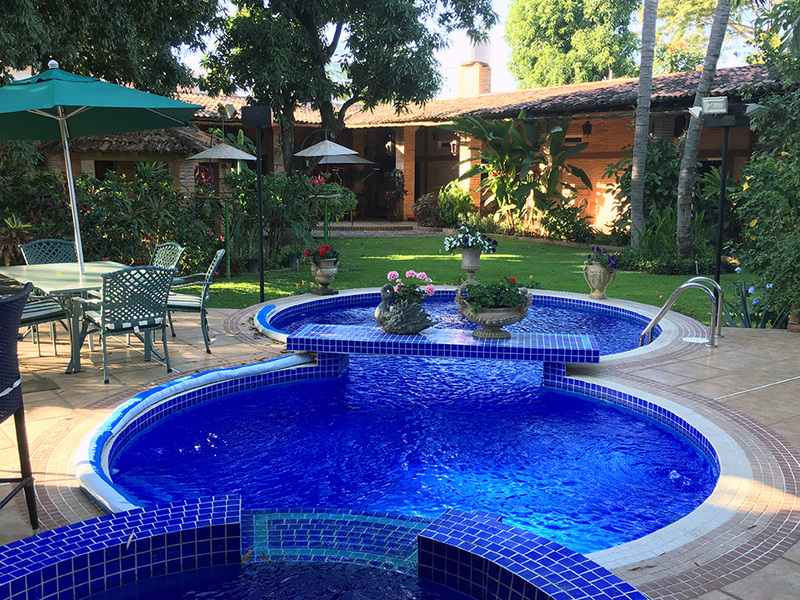 Remember to check out more photos in our photo gallery of PV and this beautiful paradise we're living in!